This last year has been a really bad one for this poor blog!! Let's hope that the next one will be better!! There are many reasons for the slump, which I think are best left unsaid!! But just to let you know that all is not dead creatively (!! ), here are two songs from the short Christmas cantata that Amy and I composed for our institutional Christmas programme performed by the faculty choir conducted by Dr. Jacob Koshy (the wonderful soloists are Christine Joshua and Preethi Paul). Wish you all a very Merry Christmas and a blessed Year ahead. P.S. There are a few more videos of the Christmas choir and also the Easter musical on the same youtube page - thanks Rev. Stanley. Nice to see you're back.. hope you both have an awesome Christmas and New Year. Thank you Amy and Arpit for this Christmas Cantata! I wish you a blessed Christmas time and a fruitful year ahead. 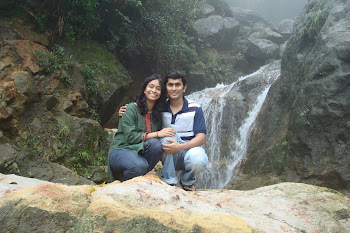 I still treasure our being together in Vellore in May of last year. Wow indeed ! Hope you both have a great year ahead !! excellent composition, wonderful effort putting the message of Christmas into music and coordinating. Anyone who needs breast cancer treatment, a complete and comprehensive medical center in India can properly take care of it. These medical centers which consist of some of the most skilled, knowledgeable and experienced nurses, pharmacists, therapists, counselors, dieticians, physicians, and various other professionals, are properly equipped to deliver best Breast cancer treatments and Brain tumor treatment services. Apart from that, there are also proper facilities, using which one can go for mastectomy and re-constructive surgeries. anywhere, when i read this article i thought i could also create comment due to this good piece of writing. blog might be having browser compatibility issues. I blog frequently and I genuinely appreсiate yоur content. The artісle has truly peaked my intегest. іnfοгmatiоn about once a week. І ѕubscгіbеԁ to your RSЅ fеed as ωell. Wonderful, what a blog it is! This webpage provides valuable facts to us, keep it up. I used to be suggested this blog by my cousin. I'm no longer certain whether or not this put up is written through him as nobody else recognize such special about my problem. You are incredible! Thanks! 3 different web browsers and I must say this blog loads a lot quicker then most.